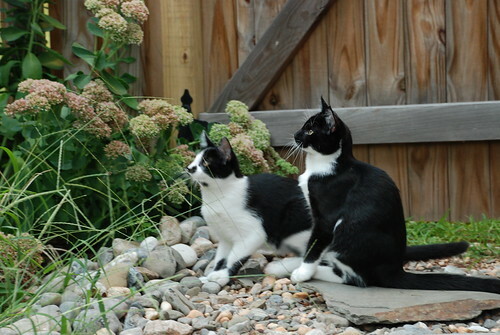 Having the kittens in my life has allowed me to remember the wonderment of experiencing something for the first time. As adults, I think we lose this perspective. Its the same old - same old, day-in-day-out. We fail to notice the magic in the ordinary. Since being in my care, the kittens have never gone outside, except for the one or two times they made a curious "sneak" onto the front porch. They watch with great interest as I do yard work in that 'magical', forbidden place called the outdoors. 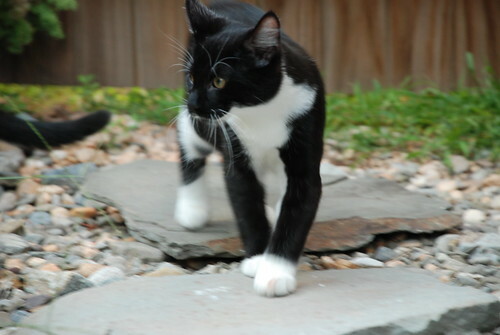 Today, since I was letting Ranger out, I decided to let the kittens come outside for an adventure. 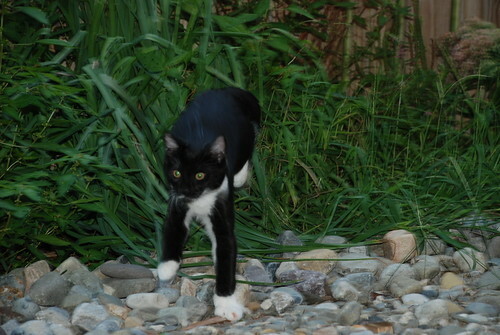 They stalked bugs, walked on stones, rocks and dirt for the first time. They followed Ranger around a bit to see what he did. He goes for the grass. 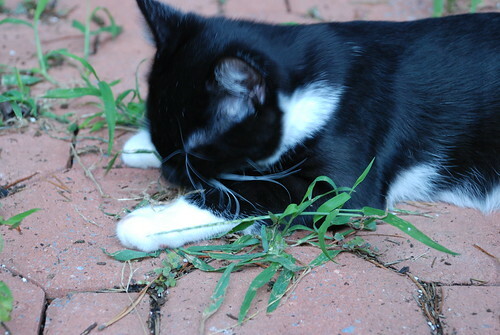 So the kittens tasted grass for the first time. They were furry balls of excited energy. What do we do next? Where do we go? Can we eat that? What is this? Many of my pictures are blurry as I tried to capture them batting at flying bugs or stalking each other. 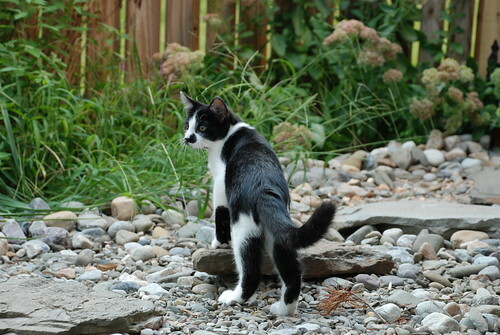 Below, Stache stalks Dash. 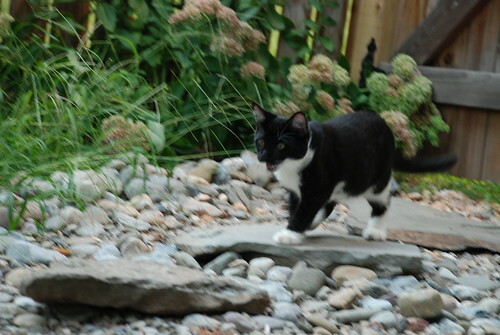 He would run along the stepping stones and launch himself into the hostas and scurry along the fence, under the cover of the bushes. He's actually panting here from all the running around he was doing. 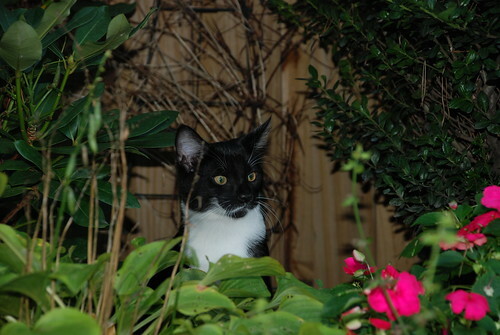 As he would pounce around in the bushes, he would let out these meows that sounded more like roars. Here he is checking out where Dash is, so he can attack. Stache leaps out from the 'brush'. Here are two videos of their play. You can see that Dash is more cautious. He sticks to the edges of the garden, not wanting to dive into the dark places. Stache on the other hand, dove right in and was loving life. Dash was having a wonderful time too - - just not interested in going into the 'jungle'. Here is Dash with one of his GQ poses. Watching them explore and enjoy their adventure today was such a blessing.